The Lutron Diva dimmer is a simple and elegant solution designed to match your existing designer opening switches and accessories. You can easily turn the lights on and off with the paddle style switch. While the lights are turned on, use the slide control to adjust the lights to your desired level - creating the perfect lighting for any occasion. Complete the look of your home with a Claro screwless wall plate, sold separately. Installing a Diva dimmer is easy and saves energy too. You can replace your existing switch with a Diva dimmer in as little as 15 minutes. Then dim the lights just 50% to save 40% electricity and extend bulb life 10 times. Available in 7 gloss colours, your wall controls, wall plates and receptacles become beautiful accessories that let you create, coordinate, accent, blend and balance to express your true style. The Maestro Dual Dimmer is a great replacement for stacked switches commonly found in kitchens and bathrooms. It combines the function of two dimmers in one control, but is still packed with all of Maestro's smart features. The easy-to-operate tap switch turns lights on/off to your favorite light level or tap twice for full on. Press, hold and release the switch for delayed fade-to-off. Delayed fade-to-off gives you 10-60 seconds to leave the room or get into bed before the lights go out. Adjust the light level for any activity using the rocker. LEDs display the light level and glow softly in the dark, so you can easily find the control. For use with incandescent/halogen lighting only. Coordinating Claro wall plates and accessories sold separately. 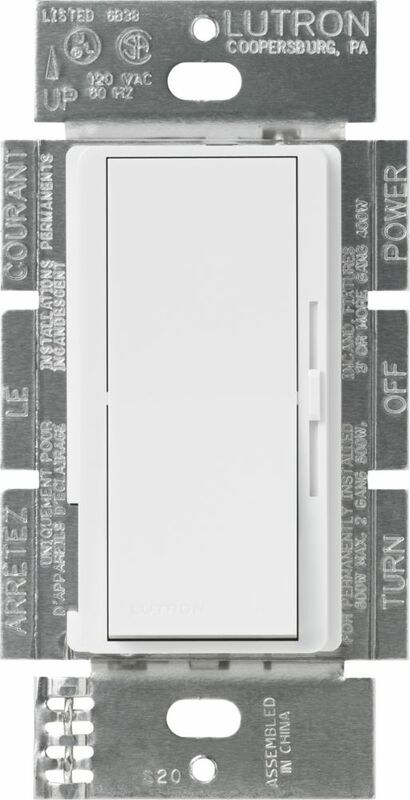 Diva 600-Watt Single Pole Dimmer - White The Lutron Diva dimmer is a simple and elegant solution designed to match your existing designer opening switches and accessories. You can easily turn the lights on and off with the paddle style switch. While the lights are turned on, use the slide control to adjust the lights to your desired level - creating the perfect lighting for any occasion. Complete the look of your home with a Claro screwless wall plate, sold separately. Installing a Diva dimmer is easy and saves energy too. You can replace your existing switch with a Diva dimmer in as little as 15 minutes. Then dim the lights just 50% to save 40% electricity and extend bulb life 10 times. Available in 7 gloss colours, your wall controls, wall plates and receptacles become beautiful accessories that let you create, coordinate, accent, blend and balance to express your true style.